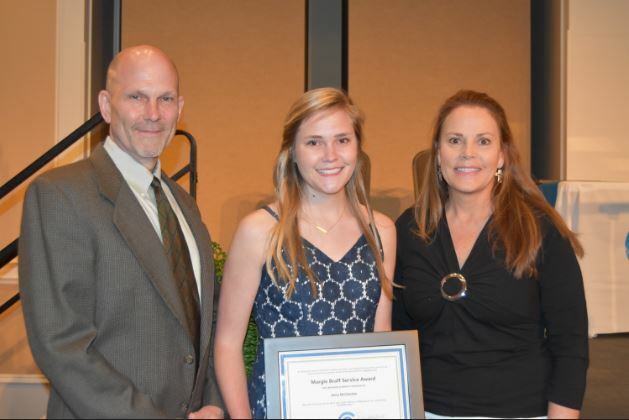 Pictured: Anna McClendon, scholarship recipient, with her parents. Several area students received $500 college scholarships during our recent 50th Anniversary Honors Night Celebration at First Baptist Church in Gainesville. Rachel Hendrix, the current president of Lakeview Academy’s Honor Council and a passionate volunteer at a local animal shelter. She plans to attend Tulane University in New Orleans. Anna McClendon, a Lakeview student. She has donated over 400 hours of her time to community service and enjoys working with children at YMCA’s Camp High Harbour and Browns Bridge Community Church. D’Mahri Robinson, a Gainesville High School senior with a big heart for others. He provides free photo shoots that build self-esteem by focusing on the individual’s character rather than appearance. Clay Coffey, a Gainesville High student and baseball player who credits his Center Point ethics class for shaping his positive viewpoint of the world around him. Erika Turcios-Galves, a senior at West Hall High School and one of our interns at Center Point this past school year. Erika has volunteered at the Georgia Mountain Food Bank and HoPE (Hispanic Organization Promoting Education).